In October I started a series of posts on agile. For me there were three reasons to start writing those posts. First, I worked in an agile environment, second, I felt there had to be more to agile than its most commonly mentioned method SCRUM and third it was a way of preparing myself to go to the Agile Testing Days. Now that I have returned from the conference I would like to share my experiences with you in several posts. I am going to use the discussion with Huib Schoots about going to conferences as a starting point to describe the social aspect of going to a conference. Other posts will go deeper into the content when I have digested the information bombardment. Why should testers attend conferences? My argument at the time was: “Conferences typically are the place where you can learn the latest developments and opinions, submerge yourself into the testing mindset, confer with your peers, refresh your ideas and expand your network”. Well at the Agile Testing Days this was absolutely true. But, and this is something I will have to be adamant about, this does not happen automatically. There are a few conditions to consider. Preparation You need to prepare yourself; for instance by knowing who the speakers are and what their subjects are. And not only to determine to which talks you want to go but also to ask yourself if it would be interesting to talk and discuss with them about it. Being Approachable Most of the speakers and delegates, as I have experienced, are very approachable and like to talk to you about almost anything. A conference can be so much better if you are open to this yourself and are courageous enough to step up to others and start a conversation. Look beyond the program Conferences, typically those that host different nationalities of speakers and delegates, do not stop when the talks are finished. Get together with the people you meet. Go out and have dinner with them, or get a drink at the bar. Why would you lock yourself up in your hotel room. A conference is not like a class room where you enter at a scheduled time and leave once class is over. Enjoy Go and talk about what you have on your mind. It does not even have to be about anything from the conference or testing even. There is great stuff to learn, great people to meet and lots of fun to have. And even if you think you have nothing to talk about there is a lot to gain by listening and watching the interaction. But I am pretty sure once you are there conversations will happen. Having said all of the above you might question how I fared myself. Well I started with inquiring who else, other than my colleagues (Frank Pellens, Huib Schoots, George Stevens and Robert Copoolse), was going to go the Agile Testing Days by sending out a few tweets on this matter. As it turned out there was a division between either the Agile Testing Days and with EuroSTAR within my followers. After some conversation Lisa Crispin and I agreed to meet on the Sunday evening before the conference. Now having set a date others would be able to join in. We ended up having a very enjoyable and entertaining dinner at Petite Pauline with Tamara Taxis, Liz Keogh (Picture: Liz folding origami animals from Euro bills), David Evans, Stephan Kämper, Huib Schoots, Bob and Lisa Crispin and myself. Back at the hotel we went for another drink at the bar and found that several people that we as a group knew, like Michael Bolton, were to be found there also. So even before the conference had started I was meeting new people, talking to them and started a rolling snowball that would keep on growing during the rest of the conference. Now that I had made contact and kept an open spirit I found myself getting to know lots of new and interesting people during the conference. Additionally I reconnected with people who I had met before and all of them added to my story of these Agile Testing Days. A story that enriched me and let me have much more content, context, depth and interactivity during the conference than when I had only gone there to listen. One of the other highlights was something Huib Schoots and I organized. Having heard about lightning talks and rebel alliances at other conferences we kind of felt the Agile Testing Days should have something similar. And if it were to happen we wanted to be part of it. So what better way to ensure that than to organise one ourselves. We contacted the guys from Diaz-Hilterscheid and after some explanation we were allowed to rent a room at the venue. Shortly after we made an initial selection of people we would like to meet and that we knew were coming to the Agile Testing Days. In that mail we called our gathering the Potsdam agile Testers Session or PaTS. We planned to start with the people who reacted positively on our mail and would see who else would like to join us whilst in Potsdam. On the third day of the conference we (Rob Lambert; Rob van Steenbergen; Daniel Lang; Janet Gregory; Simon Morley; Brett L. Schuchert; James Lyndsay; Stevan Zivanovic; Jim Holmes; Bart Knaack; Lisa Crispin; Olaf Lewitz; Mike Scot; Jurgen Appelo; Thomas Ponnet; Cecile Davis; Michael Bolton; Huib Schoots and myself) got together in the TestLab, ordered some beer and pizza and started talking. 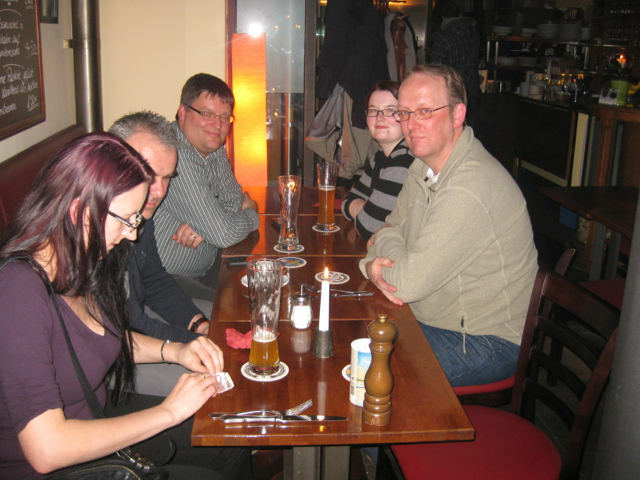 While getting in the mood for the Agile Testing Days 2011 in Potsdam I remembered seeing a XP exercise sometime before. Essence of the exercise was to use the agile manifesto, its principles and to link them to development practices. This really felt as a great practical extension to my previous two posts on agile. Only trouble was that it had forgotten who wrote it so the exact steps were unknown to me. Also I remembered that it originally targeted an XP development audience and that I felt that it needed some adjustment to be useful for (non-coding) testers. At the same time I was getting ready to participate in the TestNet workgroup theme night with the Agile Testing workgroup. While e-mailing with the workgroup chair, Cecile Davis, I offered to use a recreation of the exercise suitable for testers and to translate the manifesto and principles into Dutch along the way. At the following meet the other workgroup members liked my idea and draft version of the exercise. So at the TestNet workgroup night on November 8 I have presented and executed the exercise in front of some 30 people. All in all the execution of the exercise was a success and I received positive feedback. Several participants were interested in doing the exercise with their team. But personally to be honest I quickly saw after the introduction that in spite of the good idea the six exercise steps I had written were not going to work with such a large group. So the exercise was saved by improvising, getting some goodwill and by offering additional explanation during and after the execution. Also I discovered that trying to keep it inside the period of an hour was a real challenge. In good agile tradition I concluded the evening with a retrospective. Combining feedback from the participants with my own feedback I put new items on the (virtual) backlog. First one was to write this post, second to do a re-write of the exercise in general and thirdly to make an adaptation of the exercise steps in order to make them suitable both for smaller and larger groups. Both the content and the ‘new’ exercise steps of the exercise will be part of the following sections. The Dutch version, containing I believe the first complete translation of both the agile manifesto and the principles, will be placed on the TestNet ‘Agile Testen’ workgroup page [TBD]. A room with possibility to form groups, walk around, and hang the print outs on to the wall. Give a (short) presentation on the Agile Manifesto and its principles. Depending on the agile experience of your audience this can be shorter or longer. Check my previous two posts for to get additional information or inspiration. Group members discuss what the principles mean to them and how they map to the Agile Manifesto. Depending on the time you have and on the familiarity of your audience with the Agile Manifesto you can spent longer or shorter amounts of time on this. In larger groups this tends to take a lot of time and is probably best added into the step 1 presentation or left out all together. Present the practices and handout a hardcopy version of them to all participants. Depending on the experience of your audience (and the time you have) you can provide information about all of the practices (takes a lot of time), or let the audience indicate which ones need to be elaborated or skip explanation al together. Have the group go up to all of the principles and have them discuss and map the practices that they think fitting to the principle. Mapping should be visualised by writing the practice on to a post-it and sticking it to the top of the sheet if it is a good fit, to the bottom of the sheet if it only fits partially. The group should form a consensus on the which practices fit and to what extend. The aim here is to learn by actively linking practices to agile principles by discussion and argumentation. When necessary the facilitator should provide additional information and elaboration about the practices. Divide the audience into smaller groups of no more than 6-8 people. Then execute step 3 by letting them go by all principles from a different starting point. To aid the visual result you can hang multiple versions of each principle (as many as you create groups) next to each other and differentiate the groups choices in this way. Have each group pick one or two of the principles and let them explain why they chose those practices and why they placed them higher of lower on the sheet. The other groups should be able to ask questions. This step is more about sharing information and reasoning then that it is about argumentation and justification. A single group will have done this automatically during the exercise. Have all members evaluate what they have learned and taken away from this exercise. One of the take aways should be to pick one or more practices that they are going to actively work on during the next period. Then execute a (quick) retrospective on the execution of the exercise. Depending on the group size and time you have left this can be down by letting each member express this to the group or to let them do this individually later. A practice is something that has proven to be valuable in a certain context and offer insight into solutions that may or may not work in your situation. You can do this with the list below for a start. But preferably create you own shorter, longer or more suitable list. Basically you can do this with any kind of practices not just test related practices.